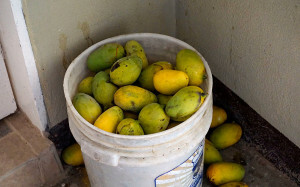 May 7, 2015 / Comments Off on It’s Mango Season! KABOOM! The tranquility of a spring afternoon in Fond Blanc is shattered by the sound of a ripe mango bouncing off the tin roof as it drops some 20-30 feet from the tree above. 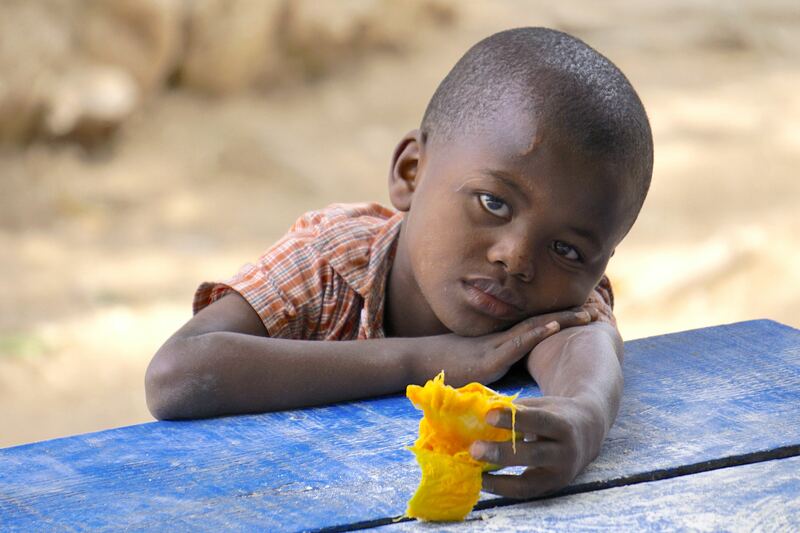 The mangoes at the orphanage can be the size of a large raw baking potato – and just as firm and heavy. Already this spring we’ve seen more than one person bruised by the falling fruit. We are fortunate that there been no direct hits to someone’s head, but as much as we all like to sit out under the mango trees in the courtyard, I guess we’re resigned to that happening at some point. The mangoes are plentiful during this season, which could stretch into early June if we are lucky. Pastor Shmy and Fre Theo get the children to collect the fallen fruit in whatever containers we can find to hold them all. And the children are pretty good about helping out, but there’s a lot of mango eating going on too. Pretty much everyone feasts on mangoes around this time of year, and the children -being children – manage to overdo it upon occasion. We chose to feature the mango tree in our Fond Blanc Foundation logo because so much of daily life plays out under the large mango trees in the courtyard in front of the orphanage building. But it is also a good symbol of the way the children can revel when bounty falls their way (no pun intended), without ever feeling sorry for themselves when they must do without something. It is wonderful to experience their simple, child-like joy, and impressive to recognize how rarely they ever complain. People often ask us about where the rural Haitians find food, and mangoes are one of the answers to those questions. Mangoes are far and away our largest homegrown food source. We lack sufficient space at the orphanage to properly cultivate most food plants in any real quantity, but we do get a decent supply of plantains (they look similar to bananas), and we enjoy a more limited crop of avocados from trees that Pastor Jean Claude had planted in the compound. In this photo, Kervins is clearly exhausted by his mango meal. He fell asleep at this picnic bench about 5 minutes after we took this photo. It is worth mentioning that the children’s diet is now much more nutritionally balanced thanks to our donors’ support, but we never could manage to supply as much fruit as the children enjoy during mango season. 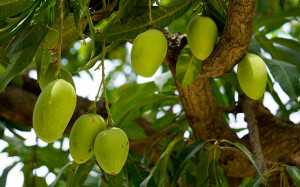 Although the mango is not originally a Haitian plant, it apparently thrives in the Haitian climate. Even though there are over 1000 varieties of mango worldwide, many experts will tell you that Haitian mangoes are among the most flavorful anywhere. Unfortunately, most of us have never encountered one in an American grocery store. So, if by chance you are planning to visit us by early June, there may yet be a chance for you to enjoy a feast of mangoes from the fruit still ripening on the tree branches. Let us hope that will be the case, because the kids are not saving any!